Samara Francisco is trying to bring more projects into her Soulsville Charter School classroom this year. But the new teacher at Soulsville Charter School now hopes to bring projects into her ninth-grade classroom, inspired by what she learned at High Tech High, the California school through which she obtained her master’s degree in 2014. The school in San Diego emphasizes projects over tests and gives its teachers autonomy on content. High Tech High was highlighted in “Most Likely to Succeed,” a 2015 documentary screened last month in Memphis as part of a discussion on project-based learning. Chalkbeat spoke recently with Francisco to learn more about her background and experiences with project-based learning, one of the components being studied for the proposed Crosstown High School in midtown Memphis. What was your education like growing up in Memphis? My background is a little unique because I started at Chimney Rock Elementary School, but my parents decided to put me into private school for three years. They ended up deciding public schools were just as good of an option, and I eventually ended up at Houston High School. It was at Houston, which was not very diverse when I was there, that I first realized the important role of race and class in public education. I was tracked pretty early on into advanced classes, and I was often the only minority there. I went to college at Washington and Lee University in Virginia, and one of my minors focused on poverty and human capability. It made me start thinking about ways my future career could help marginalized communities. Through that minor program, I ended up doing an internship at a nutrition camp over one summer in Helena, Arkansas. I saw the impact of what happens in the summer and … the slide (some kids) experience. I decided to apply for Teach For America and ended up in Marianna in rural Arkansas. 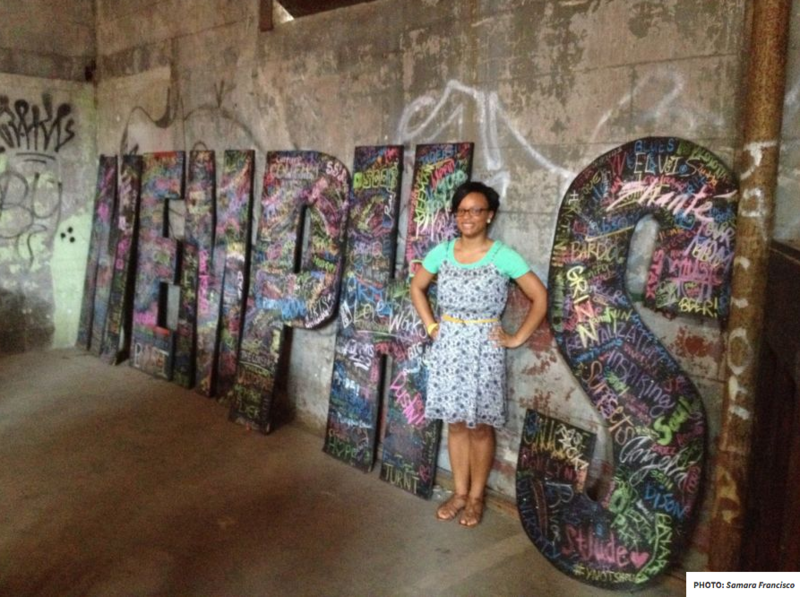 I ended up teaching in Arkansas for a couple of years and … working for KIPP in Memphis for three years. I wasn’t exactly expecting to become a teacher in college, and didn’t even know if I’d stick with it after TFA, but it goes back to my experiences in college and desire to impact lives in a tangible way. What better way to do that than by teaching? Why did you decide to leave Memphis and pursue a master’s degree at High Tech High, a school you had never visited before? My first years of teaching, my biggest question was, “How do you actually get kids to do work that matters?” It’s hard to get kids to care about the work they do in school. I wanted to create a more engaging atmosphere for my students, and I also wanted to get a master’s. I started looking around at programs and a friend told me about High Tech High’s program, where you can earn a master’s degree while still being involved in a classroom. I really wanted to get a master’s in a year without taking a break from teaching, so this was perfect for me. Project-based learning is a trendy topic in education right now, but there’s no set definition or formula. What did this kind of learning look like at High Tech High and how did students react? I didn’t realize how vastly different it would be from what I had experienced in Memphis. Kids at High Tech High weren’t filling out a bunch of worksheets throughout the day, and teachers weren’t trying to keep to the time crunch for every lesson. I was working with students on English at High Tech High Media Arts, and our project was an in-depth research paper. That’s not some kind of crazy, out-there project. What made it such a different experience for these students was the time and freedom they had to dig deeply into ideas and express themselves. Halfway through the year, the director of my placement school High Tech High Media Arts invited me to teach history and English. I was pretty worried about how to make sure I could teach history and English in just one semester; I was still in the test-prep culture of Memphis, I think. Whatever project my students did, I wanted them to ask “Who is the audience?” That’s a big deal at High Tech High — making sure the audience for students’ work is more than just their teacher. It’s amazing how motivated students get when they realize their peers, parents or friends will be seeing their project, too. 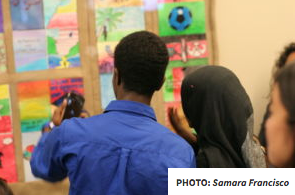 Samara Francisco’s students at High Tech High take photos of their work, which illustrated stories of refugees. What’s a project that your students did at High Tech High that you’re proud of? I had taught the book, A Long Way Gone while teaching in Memphis. It’s about a child soldier, and I brought it to High Tech High as a project, where they would read the book and then interview a refugee. I ended up partnering with another teacher and designing a project where we had 25 groups of students each assigned to a refugee in the area and wrote their stories. We then had them make an artistic interpretation of part of those stories and had them displayed at the San Diego Airport. The students were so motivated when the people they interviewed were at the exhibit, sitting next to them. Knowing they approved of their project mattered much more to them than getting an A. It made them work harder. Why did you decide to come back home? What are you hoping to bring to the Memphis education scene? There are people beating down the doors to teach at these schools in San Diego, but my heart was in going back home. I’m excited to see a pipeline of strong, passionate teachers in Memphis. I’ll be teaching ninth grade atThe Soulsville Charter School, and I’m optimistic because teachers have the freedom here to teach what’s best. I’m willing to take up the challenge of how to make what we did in San Diego work in Memphis. We can shortchange students by not giving them the opportunity to create on their own. And we can also kill student motivation to succeed with a constant emphasis on testing. Incorporating projects in the classroom allows for student work to go beyond their desk. We all want to do good work and have others see and benefit from it. Why do we treat student work any differently?